Friday Feb 24 – We have another warm day on tap, but will have some clouds to battle with the sun. The numbers from Thursday’s near record warmth are in and they have helped bump the average for this month nearly a full degree. That places February 2017 now at 4th warmest on record. We still have the warm day today, but a transition to much colder air over the weekend will take some steam out of the air. However, there is another warm on next week that should help bump this month to at least 3rd on the list when finish. Following the warmest Feb in 1976, the winters of 1977 and 1978 were very cold and snowy. 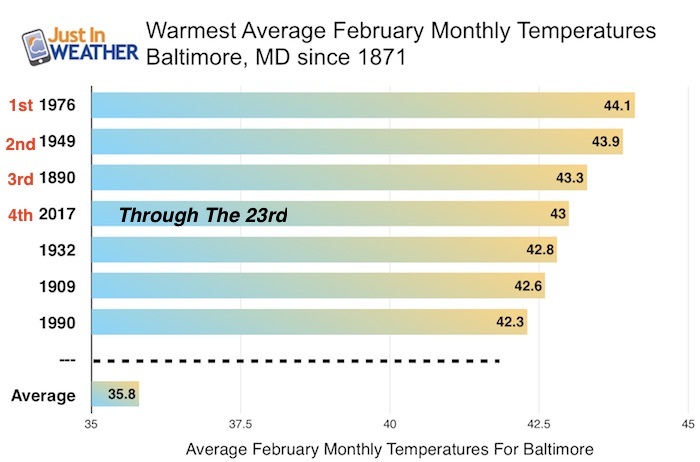 Following the 2nd warmest Feb in 1949, Baltimore had the lowest snow total on record in 1950 with 0.7″ for the season. Following the 3rd warmest Feb in 1890, the next winter had 35.9″ snow in 1891 which was 75% increase above average. Basically this warm month is not an indication of what next winter will be like.. but we have seen extremes on both ends in the past. 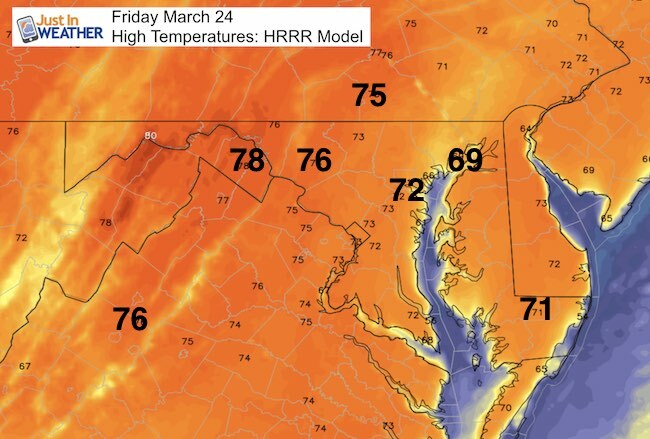 With the clouds and cold front approaching, it is possible the temps tonight stay near 60F around Baltimore. But the winds will pick up on Saturday. Plan your outdoor events in the morning, as the front with rain and possible thunderstorms will pass during the afternoon. This radar simulation shows the timeline… but the time frame does skip every three hours for the afternoon. My next report will have a little more detail for the arrival of the storms. 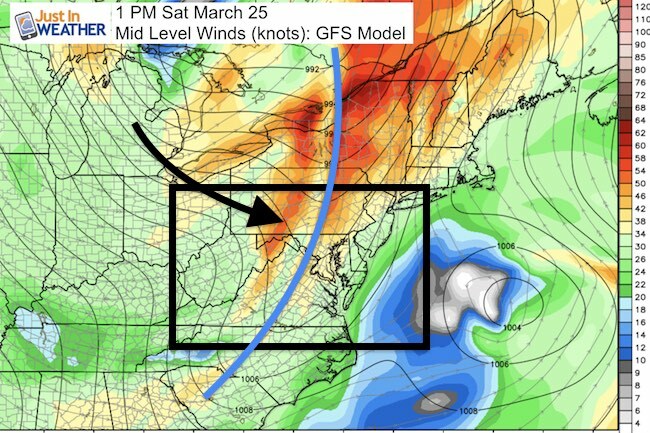 This will usher in the colder air with highs in the 40s for Sunday. That is closer to reality, but will feel chilly comparatively speaking. This cold front will be strong, but the snow seen here should stay in the mountains and west. 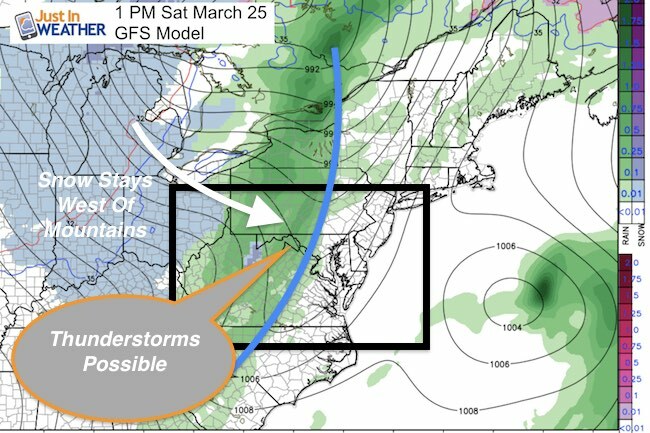 There will be another chance for at least flurries with the nectar cold front at the end of next week. It is still winter for another 4 weeks. Note: Today is the final day for voting in the Baltimore Sun’s Readers Poll. I appreciate the nomination for Best Meteorologist. If you want to vote, click here and scroll down to item 52 and let’s see if we can do it again. Then come back to see the info below. I see this as a group effort since you are part of what pushes my social media along. 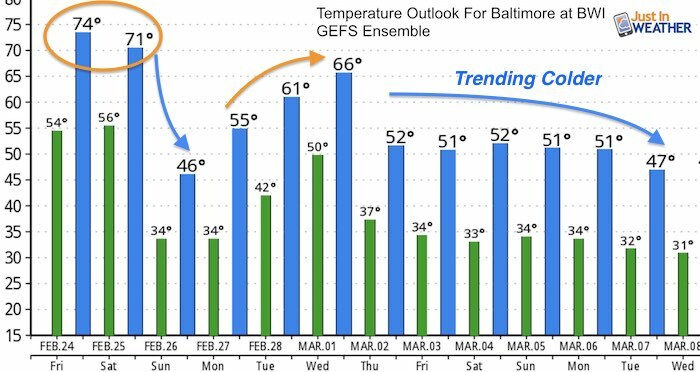 The next warm up should not be a potent, and followed by a pattern change that will last into mid March at least.